This document summarizes the text composition requirements in the Chinese writing system. One of the goals of the task force is to describe the issues in the Chinese layout requirements, another one is to provide satisfactory equivalent to the current standards (i.e. Unicode), also to promote vendors to implement those relevant features correctly. This document was created by the Chinese Layout Task Force within the W3C Internationalization Interest Group, and in collaboration with the W3C HTML5 Chinese Interest Group. The Internationalization Working Group has been a great help during the writing of this document. The Chinese Layout Task Force will work with Internationalization Working Group to publish Working Drafts of this document, and to widen the exposure and review of the document. The writing system of Chinese script may use traditional or simplified characters, which may apart from the differences between glyphs and strokes; while in different areas that using Chinese (Chinese Mainland, Taiwan, Hong Kong, Macao, Singarpore, Malaysia etc.) may apply composition rules to both scripts that different from other locales. There are two writing modes: vertical and horizontal. The former is often seen in publications from Taiwan, Hong Kong etc. In principal, the characters, including Chinese (hanzi) characters and punctuation, used in Chinese composition are squares with the ratio of 1:1, and are seamlessly arranged with one another. Each cultural community has its own language, script and writing system. The transfer of each and every writing system into cyberspace is a task of utmost importance for information and communication technology. As one of the basic work items of this task force, this document summarizes the text composition requirements in the Chinese writing system. One of the goals of the task force is to describe the issues in Chinese layout requirements, another is to provide satisfactory equivalents to the current standards (i.e. Unicode), and another is to prompt vendors to implement those relevant features correctly. This document was developed by people working in different areas, using both Simplified and Traditional Chinese. We very much appreciate the contributions of the editors and collaborators from different linguistic backgrounds, and their willingness to collaborate across linguistic boundaries. In this early version of the Working Draft, the version of the script used for the Chinese text depends on the person who contributed the text. We plan to create separate translations of the Chinese text in future versions of this document, but at this early stage, the original contributions are kept as is to enable rapid development of the text. You can view the document in a single language using the buttons at the top left corner of the page. Text with a yellow background, like this, needs updating to match the latest edits to the document. It does not fully cover all details of the Chinese composition system, but mainly describes the differences from Western Typesetting and Requirements for Japanese Text Layout. It explains in detail the similarities and differences among different areas and Traditional/Simplified Chinese composition. It describes presentational results and considers these results as issues and requirements for Chinese text layout. Meanwhile, it offers principles or methods for handling these issues, without describing particular technological solutions. It suggests solutions for, or explains, present-day issues that people face in Chinese composition. It provides typical instances of Chinese composition and their actual use cases as much as possible. In consideration of non-Chinese readers of this document, figures are used for explanation wherever possible. It mainly explains modern Chinese publications, going back as far as the introduction of moveable type for Chinese printing. Although there are some differences between those early printed publications and current day publications, they are still considered part of Chinese composition. The document does not yet fully cover ancient books. Future editions may be revised to cover composition of such ancient publications. For non-Chinese readers, frequency of use is indicated for each requirement. These frequencies are not the outcome of any accurate research, but arise from the long experience of the authors. Non-Chinese readers should understand that they are intuitive for ordinary Chinese readers. These frequencies serve to provide a general guidance for the prioritization of issues. The main target of this document is common books. But other publications, such as magazines or newspapers, are also included. The majority of the text used in Chinese composition consists of Han characters (Hanzi). Chinese characters include Traditional Chinese and Simplified Chinese alternatives. The former is commonly used in Taiwan, Hong Kong and Macao while the latter is commonly used in Mainland China, Singapore and Malaysia. Different glyphs are used in different regions. One Unicode code point of a Chinese character may have more than one valid glyph, depending on operating system and typeface used. The focus of this document is Chinese composition and will not cover glyph variations in detail. In addition to Chinese characters (Hanzi), various punctuation marks, as well as Western characters such as European numerals, Latin letters and/or Greek letters, may be used in Chinese text. One Simplified Chinese character may have more than one corresponding Traditional form. For example, the Simplified Chinese character 发 can be mapped to either the Traditional Chinese character 發 or 髮. By contrast, the circumstances where one Traditional Chinese character corresponds to more than one Simplified Chinese character are fairly rare but still worth noting. For example, the Traditional Chinese character 乾 may be mapped to either the Simplified Chinese character 干 or 乾. The mapping relationship between Traditional and Simplified Chinese is not one-to-one and particular character conversion depends on its context. Chinese characters have square character frames of equal dimensions. Aligned with the vertical and horizontal center of the character frame, there is a smaller box called the letter face, which contains the actual symbol. (There should be some space left between the letter face and the character frame). Character size is measured by the size of the character frame. Character advance is a term used to describe the advance width of the character frame of a character, which should be the same as the width of the character. In principle, when composing a line with Chinese characters, no extra space appears between their character frames. This is called solid setting. From the advent of moveable type, each character was set to be flush with one another without any gaps, regardless of vertical or horizontal writing mode. However back then, several sizes of the original pattern of a letter were required to create matrices, while in today's digital era, the same original pattern can be used for any size simply by enlargement or reduction. Because of this, it might be necessary to adjust inter-character spacing when composing lines at large character sizes. When composing lines at small character sizes in outline fonts, hinting data is used to ensure that the width of the strokes that make up a character look correct. When only a small portion of the fonts are smaller, they will be displayed in bitmaps, and there is no need to make extra adjustments. Depending on the context, in addition to solid setting, several alternative setting methods can be used, as described below. To achieve a balance between running heads with different numbers of characters, increased inter-character spacing is used for running heads with few characters. For captions of illustrations and tables, which only have a few characters, increased inter-character spacing is used to achieve balance with the size of the illustration or table. In some cases, increased inter-character spacing is used for poetry with lines of only a few characters, so as to maintain the balance of the layout. For publications whose main audience is children, inter-character spacing is increased to make it easier for them to read. To deal with rules that forbid certain characters at the beginning or end of a line. When a punctuation mark which is not supposed to be positioned at the end of a line happens to appear there, even inter-character space setting is used to move the character before the punctuation mark to the next line together with the punctuation mark. When a punctuation mark, which is not supposed to be positioned at the beginning of a line, happens to appear there, it is necessary to move the last character from the previous line to the beginning of the next line, and there will be one or two (sometimes more) empty spaces left in the previous line. Even inter-character space setting is used to unify the length of each line and justify them. Even inter-character space setting is used when the number of characters in a table head differs from the table content, such as for person names, so as to justify the table. For characters in headings of magazines or advertisements, reduced inter-character spacing can be used to keep the characters on one line, or it can also be used to achieve a special effect for presentation. Since Chinese characters are all square-shaped, this method does not apply to headings and content in books produced by letterpress printing. The following sections describe common practice and contexts for the use of these four typefaces. Song, also known as Songti or Ming, is currently the most common typeface used in Chinese printing. As seen in . Song is commonly used in text, headings and annotations. When used in headings, the characters will appear in a bold face, so as to distinguish the heading from the text. Kai also known as Kaiti or regular script, is another major typeface, which provides calligraphic styles for Chinese characters. It shows notable handwriting features. As seen in . Kai is mainly used in text that needs to be differentiated from the rest of the content, for example, headlines, references, quotations, and dialogs. It is rarely used for emphasis, because of its similarity to Song. Since Kai retains some calligraphic features, it is widely used in official documents and textbooks. Hei, also known as Heiti or Gothic, is a type style characterized by strokes of even thickness, reduced curves, and a lack of decoration. It is commonly used in headlines, signs, and personal names in dialogs. In body text, characters in Hei style with thicker strokes typically indicate emphasis. As seen in . Traditionally, publications rarely apply the Hei style for content, but with the growing influence of the World Wide Web and the digital publishing industry, some publications are starting to experiment Hei in this context. The Fangsong (Imitation Song) style lies between Song and Kai. It is commonly used in isolated paragraphs such as quotations or highlighted sentences. As seen in . The type area, sometimes called the printing area, is the rectangle in the middle of the page that contains the main body of the text. It is surrounded by space containing headers, footers, notes, etc. Books are usually designed in the following sequence. First, prepare a template of the page format, which determines the basic appearance of document pages. Then, specify the details of actual page elements based on the template. Books usually use one basic template for page format, whereas magazines often use several templates. Although books tend to use one template for their page format, some further design effort will be needed to extend that template for pages such as the table of contents and indexes. Furthermore, there are many examples of indexes with a different page format than the basic page format, and vertically set books often have indexes in horizontal writing mode, and sometimes multiple columns. This still holds true where the goal is to make the size of the basic page template for indexes close to the size of basic page template in the basic page format. Magazines usually contain various kinds of content, which naturally leads to a variety of template designs, different sizes of characters, and varying numbers of columns. The following are the basic elements of a page format. Principal text direction (vertical writing mode or horizontal writing mode). Appearance of the type area and its position relative to the trim size. Appearance of running heads and page numbers, and their positions relative to the trim size and type area. Establishing a type area may be seen as defining not only a rectangular area on a page, but also within that area, an underlying, logical grid to guide the placement of such things as characters, headings, and illustrations. Once the grid is established according to the principles of composition, the setting of the characters must align with the grid. If the content contains Chinese characters only, it is important that the first and last characters on a line should align with the border of the type area. When both Chinese characters and Western text are mixed in the content, or forbidden locations of punctuation marks need to be taken into consideration, the setting of the content may not align with the grid. The type area defines the basic printing style of a book. The following are the basic elements of the type area. This section explains how to create an actual page format based on the type area. Realm and position of headings: The direction and size of the characters of the heading should be based on the number of lines in the type area. The size of the indent is usually specified as the number of characters in the type area. Size of illustrations: In horizontal writing mode, the width of illustrations should, if at all possible, be the width of the type area; in horizontal writing mode with multiple columns, the width of illustrations should, if at all possible, be the width of one type area column. The illustrations are usually set at the head or the foot of the page. Likewise, in vertical writing mode, the height of illustrations should, if at all possible, be either the height of one type area column or the height of the type area. The illustrations are usually set at the right or left of the type area. Page for Table of Contents, Indexes and References: The size of the type area for the table of contents, indexes and references of books is based on the size of the type area for the main body content. There are many examples of tables of contents in vertical writing mode where the left-to-right size is identical to that of the type area, but the top-to-bottom size is a little bit smaller. For a document with a single column per page, specify the character size, the line length (the number of characters per line), the number of lines per page, and the line gap. For a document with multiple columns per page, specify the character size, the line length (the number of characters per line), the number of lines per column, the line gap, the number of columns and the column gap. Set the type area at the horizontal and vertical center of the trim size. Position vertically by specifying the size of the space at the head (for horizontal writing mode) or the space at the foot (for vertical writing mode). Position horizontally by centering the type area. Position vertically by centering the type area. Position horizontally by specifying the size of the space for the gutter. Position vertically by specifying the space at the head (for horizontal writing mode) or the space at the foot (for vertical writing mode). Position horizontally by specifying the size of the space for the gutter. In most cases the type area is set at the horizontal and vertical center of the trim size, and can then be adjusted depending on its dimensions. This design method is mainly inherited from letter press printing technology. For desktop publishing, the dimensions of the type area are usually calculated based on the space between the type area and the trim size. When deciding the dimensions of the type area, it is necessary to consider both the trim size and the margin. Generally speaking, the shape of the type area could be made similar to that of the trim size. There are two traditional size systems for Chinese characters, an old one and a new one. The following tables shows the equivalence of the old size system and the new size system in the Western point system respectively. Size 5 is usually used for text content. Newspapers and magazines use both Size 5 and New Size 5. The acceptable minimum size for the text in content is Size 6 (7.875pt≒2.8mm). If a smaller size is used, it will be difficult to read due to the complex structure of Chinese characters. Line length should be multiples of the character size and each line should be in alignment with one another. For Chinese composition without intermixed Western scripts, the characters all have a square-shaped frame, so all line lengths except that of the last line of the paragraph should, in principle, be the same. The line gaps between each line should be the same throughout the book, except for special cases. It would probably help, at this point, to define what the line gap is, since it initially sounds like the same thing as line height. What are the reference points for measuring the line gap? In Traditional Chinese composition, there are cases where pronunciation marks, referred to as 'ruby' in the Japanese Layout Requirements, are inserted between lines. In such cases the line gap is not changed but kept constant. If these elements are likely to occur in the text, the line gap established during type area design needs to be of an adequate size to accommodate them. The line gap for the type area is commonly set to a value between 50% and 100% of the height of the character frame used for the type area. A shorter line gap can be chosen in cases where the line length is short or the character size of the type area is relatively small. On the other hand, the line gap usually does not exceed the character size. Increasing the line gap beyond the character size does not improve the reading experience. Chinese composition has two text directions, vertical writing mode and horizontal writing mode. Publications from Taiwan and Hong Kong are composed in vertical writing mode or horizontal writing mode; while publications from Chinese Mainland are mostly composed in horizontal writing mode, only some are composed in vertical writing mode. Ever since the letter-press printing period, the characters and punctuation marks used for Chinese composition have basically been designed to have a square character frame. Thus the same collection of printing types can be used in either vertical writing mode or horizontal writing mode, simply by changing the direction of text. However, some adjustments will be needed for the punctuation marks so as to match the writing direction of the characters and their composition. This is described in more detail in . Traditionally, Chinese publications were composed mainly in vertical writing mode, and this tradition has been largely preserved in Taiwan and Hong Kong. However, with the increasing amount of translated publications and mixed-text publications, and the default mode of writing in character processing software, horizontal writing mode is becoming more and more popular. In Taiwan, government departments, educational materials and books on natural science mainly use horizontal writing mode while literary works such as poetry and novels still use vertical writing mode. Vertical writing mode still stands as an important cultural characteristic of regions where Traditional Chinese is used. There is usually only one direction for all text throughout a book, but there are cases where horizontal writing mode is used in certain parts of vertically composed books. Tables, captions for illustrations, running heads, and page numbers are usually composed horizontally in a page with a vertical writing mode. Arrangement of characters, lines, columns and pages; direction of page progression. Characters are arranged from top to bottom, lines are arranged from right to left. Columns are arranged horizontally from top to bottom. A book starts with the left (recto) side and progresses from right to left. Characters are arranged from left to right, and lines are arranged from top to bottom. Chinese traditionally only uses vertical writing mode. When horizontal lines are used in content that is set vertically, such as on stone inscriptions or headings for newspapers and magazines. In such cases, characters should be ordered from right to left. but now this has largely been replaced by the horizontal lines that are read from left to right. Columns are arranged vertically from left to right. A book starts with the right (recto) side and progresses from left to right. Orientation of Western Text and Latin alphanumeric characters in a line. One by one, with the same normal orientation as that of the other characters. This is usually applied to one-letter alphanumerics or capitalized abbreviations. Western text or alphanumeric characters used for this arrangement should have the same fixed size and width as the Chinese characters, rather than a proportional width. Rotated 90 degrees clockwise. This is usually applied to English words or sentences. Set horizontally without changing orientation. This is usually applied to numbers comprising two to three digits. In principle, if numbers are arranged horizontally in a vertical writing mode, the width of the numbers should not exceed one character width. This rule originated in the letterpress printing era due to the fixed width of each line. Therefore, in vertical writing mode, Western text and alphanumeric characters are not limited to two digits, but the width should not exceed one character width. Some commonly seen examples include "3.0", "A+" and "2B". In horizontal writing mode there is only one way of arranging alphanumerics, i.e. the normal orientation. Arrangement of tables and/or illustrations. In vertical writing mode, align the top of tables/illustrations to the right of the page but list the headers on the right side. In horizontal writing mode, align the top of tables/illustrations to the left of the page but list the headers on the left side. Arrangement of an incomplete number of lines on a multi-column format page due to new recto, page break, or other reason. In vertical writing mode, just finish the line where it ends. The number of lines in each column is not uniform. In horizontal writing mode, re-arrange columns so that each column has the same number of lines. In case the number of lines is not divisible by the number of columns, add the smallest number to make it divisible and re-arrange columns using the quotient as the number of lines so that only the last column shall have the incomplete number of lines. Columns are not usually used in Chinese publications, regardless of whether the writing mode is vertical or horizontal. Use of columns is largely for books with translated content, or from referencing the Japanese composition method. The usage of Chinese punctuation marks differs across different regions. One major difference is how the glyphs are distributed in the character dimension and are handled differently. 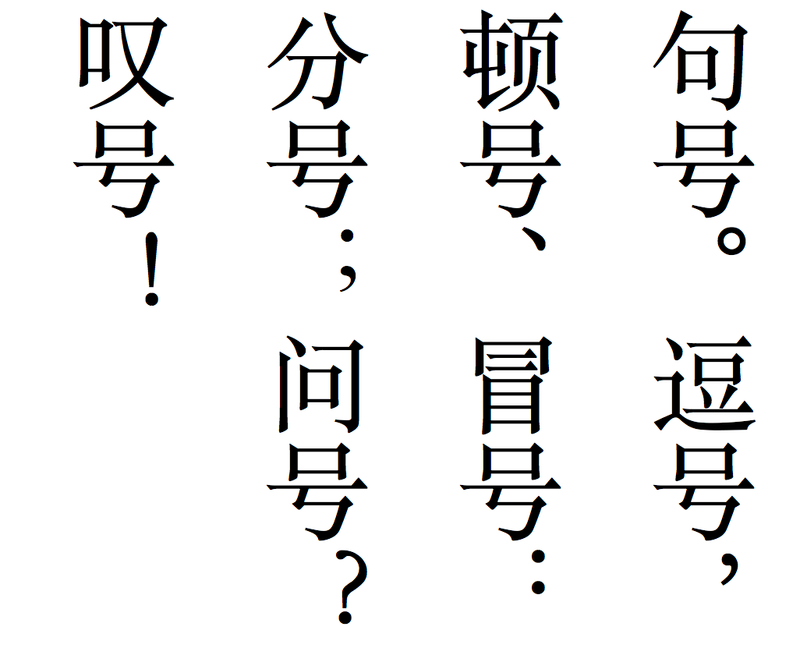 Punctuation marks are usually center-aligned in the character dimension in Taiwan and Hong Kong, while punctuation marks are distributed in the corner side closest to their annotated text in the character dimension in Chinese Mainland. The differences and the correct ways to layout punctuation marks in different areas will be introduced in detail later. Major typesetting differences between Traditional Chinese and Simplified Chinese include the positioning of punctuation and terminological variations. (See more at ). CJKV punctuation marks use different glyphs which are visually distinct between languages. Unicode currently does not distinguish each of them with unique codepoints. Usually, we use typefaces corresponding to the locale of the written text or have the layout engines adjust the punctuation marks according to the languages automatically. The content of the following section is mainly based on the content of General Rules for Punctuation (GB/T 15834—2011) issued in Mainland China, as well as the Punctuation Guidance (2008 revised edition) issued by the Ministry of Education in Taiwan. The former is a recommended national standard while the latter is not mandatory for general publications but mainly used to regulate education materials like textbooks. Pause or stop punctuation marks are used to indicate pauses or the end of a sentence. Some of the pause or stop punctuation marks appear within a sentence, such as slight-pause commas, commas, semicolons, colons, etc., while others appear at the end of a sentence, such as periods, question marks and exclamation marks. Periods, commas and secondary commas. Periods U+3002 IDEOGRAPHIC FULL STOP [。] are punctuation marks placed at the end of a sentence. Commas U+FF0C FULLWIDTH COMMA [，] are mainly used for separating parts of a sentence such as clauses, and items in lists, particularly when there are three or more items listed. Secondary commas U+3001 IDEOGRAPHIC COMMA [、] are usually used to separate items in lists, as a way to show sequence. In many college textbooks, science and technology literature, and grammar books of Western languages for example, most of which are in horizontal writing mode, where Western language are heavily used. In these cases, U+FF0E FULLWIDTH FULL STOP [．] can be used as periods, while U+002C COMMA [,] or U+FF0C FULLWIDTH COMMA [，] can be used as commas or secondary commas. U+FF1A FULLWIDTH COLON [：] consists of two equally sized dots centered on the same vertical line. It is used to start an enumeration. U+FF1B FULLWIDTH SEMICOLON [；] is a punctuation mark that separates major sentence elements. A semicolon can be used between two closely related independent clauses, provided they are not already joined by a coordinating conjunction. Exclamation marks and question marks. U+FF01 FULLWIDTH EXCLAMATION MARK [！] is a punctuation mark usually used after an interjection or exclamation to indicate strong feelings or high volume (shouting), and often marks the end of a sentence. U+FF1F FULLWIDTH QUESTION MARK [？] casually known as the interrogation point, query, or eroteme, is a punctuation mark that indicates an interrogative clause, or phrase in many languages. The question mark is not used for indirect questions. In contrast with pause or stop punctuation marks, indicator punctuation marks usually indicate a specific feature of the phrase or sentence. They include brackets, parentheses, em dashes, horizontal ellipsis, black circles or bullets, tildes, middle dots, angle brackets, low lines, and solidus. Quotation marks, usually used in pairs, are commonly used to emphasize certain characters or words, or to indicate the beginning and ending of the dialog or quoted content. If there is a need to use a bracket within a pair of brackets, the shape of the inner quotation marks will differ from the parent quotation marks. Quotation marks are a kind of bracket. When there is a need for quotation marks, Taiwan will apply single quotation marks first, followed by double quotation marks. Single quotation marks include U+300C LEFT CORNER BRACKET [「] and U+300D RIGHT CORNER BRACKET [」]; double quotation marks include U+300E LEFT WHITE CORNER BRACKET [『] and U+300F RIGHT WHITE CORNER BRACKET [』]. On the other hand, Chinese Mainland will apply double quotation marks first, followed by single quotation marks. In Chinese Mainland, double quotation marks include U+201C LEFT DOUBLE QUOTATION MARK [“], U+300E LEFT WHITE CORNER BRACKET [『], U+201D RIGHT DOUBLE QUOTATION MARK [”], U+300F RIGHT WHITE CORNER BRACKET [』]; single quotation marks include U+2018 LEFT SINGLE QUOTATION MARK [‘], U+300C LEFT CORNER BRACKET [「], U+2019 RIGHT SINGLE QUOTATION MARK [’] and U+300D RIGHT CORNER BRACKET [」]. In horizontal writing, quotation marks are usually used. But in vertical writing, use corner brackets instead. When there is a need for multiple-paragraph quotation marks, opening quotation marks should be given to the first and every subsequent paragraph, and closing quotation marks are only used in the final paragraph of the quotation. There are vertical bracket codepoints such as U+FE41 PRESENTATION FORM FOR VERTICAL LEFT CORNER BRACKET in Unicode. But they are not suitable for authors to use directly. They should be replaced via some other mechanism. Some Traditional Chinese publications in Taiwan might also apply double quotation marks first, followed by single quotation marks. Traditional Chinese might also use quotation marks, but it is hardly ever used in vertical writing mode. Parentheses, also known as brackets, round brackets, or curved brackets, contain material that serves to clarify, or is aside from the main point. According to Punctuation Guidance (2008 revised edition) issued by the Ministry of Education in Taiwan, parentheses used in Chinese include U+FF08 FULLWIDTH LEFT PARENTHESIS [（], U+FF09 FULLWIDTH RIGHT PARENTHESIS [）] and U+2E3A TWO-EM DASH [⸺] or U+2014 EM DASH [—]. Either one two-em dash (U+2E3A TWO-EM DASH [⸺]) or two consecutive em dashes can be used. General Rules for Punctuation (GB/T 15834–2011), the national standard issued by China Central Government, lists em dash as one type of dash. There are other brackets and quotation marks which include: U+3010 LEFT BLACK LENTICULAR BRACKET [【], U+3011 RIGHT BLACK LENTICULAR BRACKET [】], U+3016 LEFT WHITE LENTICULAR BRACKET [〖], U+3017 RIGHT WHITE LENTICULAR BRACKET [〗], left U+3014 LEFT TORTOISE SHELL BRACKET [〔], U+3015 RIGHT TORTOISE SHELL BRACKET [〕], U+FF3B FULLWIDTH LEFT SQUARE BRACKET [［], U+FF3D FULLWIDTH RIGHT SQUARE BRACKET [］], U+FF5B FULLWIDTH LEFT CURLY BRACKET [｛], U+FF5D FULLWIDTH RIGHT CURLY BRACKET [｝]. These brackets and quotation marks are rarely used in Chinese publications. Em Dashes U+2E3A TWO-EM DASH [⸺] or U+2014 EM DASH [—] sometimes show a continuation of tone or sound, an abrupt change in thought, or adding new content to the context. The punctuation mark takes up the space of two Hanzi. Ellipses are used to indicate a truncation of text, an unfinished sentence or a break in speech. An ellipsis in Chinese consists of six dots and takes up the space of two Hanzi characters. This is normally achieved using two U+2026 HORIZONTAL ELLIPSIS characters, side-by-side. Emphasis dots are symbols placed above or beneath characters to emphasize the text, strengthen the tone, or avoid ambiguity. For horizontal writing mode, emphasis dots are placed under the characters, whereas in vertical writing mode, they are usually placed to the right side of the characters. Both U+25CF BLACK CIRCLE [●] or U+2022 BULLET [•] can work as emphasis dots. Punctuation Guidance (revised edition) issued by The Ministry of Education in Taiwan does not include this mark but it can still be seen in some publications. Connector marks are used to indicate the beginning and end of time or space, to indicate quantity, to express the name of a chemical compound, to label a table or illustration, to connect a house number in an address, for a phone number, to separate digits which indicate the year, month and date, or to connect compound nouns and for the romanization, as well as the foreign text in the content. According to the Punctuation Guidance (revised edition) issued by the Ministry of Education in Taiwan, connector symbols include U+2013 EN DASH [–] and U+FF5E FULLWIDTH TILDE [～] or U+007E TILDE [~]. According to the General Rules for Punctuation (GB/T 15834—2011), there are three types of connector marks, namely, the short connector mark [–], the long connector mark [—], and tilde [~]. The General Rules for Punctuation (GB/T 15834—2011) does not state the corresponding Unicode code point for the three types of connector marks. However, we can make the deduction that the long connector mark [—] is U+2014 EM DASH [—] and the tilde [~] is U+FF5E FULLWIDTH TILDE [～]. Since the short connector mark should take half the width of the long connector mark, it should be U+2013 EN DASH [–]. The actual length of these connector marks may depend on the writing system as well as the typeface. Interpuncts U+00B7 MIDDLE DOT [·], also known as interpoints, middots or centered dots, are punctuation marks consisting of a vertically-centered dot, and is used to separate the first name and family name in names translated from foreign languages or minorities. They are also used with book title marks to separate chapters, articles and volumes in publications. Interpuncts apply to Chinese only. When a translated foreign name contains a Latin character, a western period should be used rather than a interpunct. For example, 比尔·盖茨 but B. 盖茨. Usage of interpuncts differs between Traditional Chinese and Simplified Chinese. In principle, interpuncts, either in vertical writing mode or horizontal writing mode, should have the same dimensions as a Hanzi; however, in Simplified Chinese, interpuncts sometimes take up half the space of a Hanzi when they are used to separate months and days, e.g. 9·11. Due to the fact that Big5 code does not give a detailed definition of interpuncts, sometimes U+FF0E FULLWIDTH FULL STOP [．], U+2027 HYPHENATION POINT [‧] or U+2022 BULLET [•] are used. It is recommended to use U+00B7 MIDDLE DOT [·] altogether. U+30FB KATAKANA MIDDLE DOT [・] is from JIS code, and is therefore not recommended. According to Punctuation Guidance (revised edition in 2008) issued by the Ministry of Education in Taiwan, book title marks are used to indicate the names of works which usually include books, articles, songs, movies, files, calligraphy and paintings. Generally, there are two types of book title marks, wavy low lines or angle brackets. Book title mark type A U+FE4F WAVY LOW LINE [﹏] has a wavy line appearance and is positioned at the foot end of the annotated text. When two works are listed adjacent to each other, their wavy lines should be visually separated. Book title mark type B includes U+300A LEFT DOUBLE ANGLE BRACKET [《], U+300B RIGHT DOUBLE ANGLE BRACKET [》], U+3008 LEFT ANGLE BRACKET [〈] and U+3009 RIGHT ANGLE BRACKET [〉]. The former pair is used for the names of books while the latter pair is used for the names of articles. Book title marks are used to indicate titles of books, articles, songs, films, documents, artworks and so on. According to the General Rules for Punctuation (GB/T 15834―2011), the names of books as well as chapters should be quoted using double angle brackets [《》]. When there is a need to indicate the name of another book within the double angle brackets [《》], the ordinary angle brackets [〈〉] should be used. Book title mark type B is a kind of brackets. Book title mark type A is rarely used in modern publications, but can still be seen in some textbooks and ancient publications. U+FF3F FULLWIDTH LOW LINE [＿] is positioned underneath proper nouns such as a person's name, the name of a place, etc. When two proper nouns are adjacent to each other, the lines of the marks should be visually separated. As with book title marks (wavy low lines), proper noun marks is rarely used in modern publications, but it can still be seen in some textbooks and ancient publications. Both U+002F SOLIDUS [/] and U+FF0F FULLWIDTH SOLIDUS [／] are used to indicate the separation of lines in poetry, syllable beats, and characters which should be separated. Punctuation Guidance (revised edition in 2008) issued by The Ministry of Education in Taiwan does not include the SOLIDUS, but it is frequently used in Taiwan's publications, including textbooks. Please find the glyphs and usage of punctuation marks at section and . There are no notable differences among different areas in the glyph of punctuation marks, the major differences are their sizes and how glyphs are distributed in the character dimension. Punctuation marks used in Taiwan and Hong Kong are usually positioned in the vertical and horizontal center of the square space left for them; while in vertical writing mode and horizontal writing mode, some of the punctuation marks are positioned in different directions so as to mark the corresponding characters more accurately. In Chinese Manland, the punctuation marks are usually positioned following the characters they are supposed to mark; while some punctuation marks might be positioned in different directions due to the vertical or horizontal writing mode. Also, different writing modes might require different punctuation marks to fulfill the same function, e.g. horizontal writing mode requires curved quotation marks while vertical writing mode requires angle brackets. Pause or stop punctuation marks include the slight-pause comma, comma, semicolon, colon, period, question mark, exclamation mark, etc. They take the same dimensions as well as the direction as a character in their respective writing modes does. In Taiwan and Hong Kong, pause or stop punctuation marks are usually positioned in the vertical and horizontal center of the square space left for them. In Chinese Mainland, they are positioned in the top or bottom side in the space left for them following the marked characters. In horizontal writing mode, the pause or stop punctuation marks are placed at the lower left corner in the square space while in vertical writing mode, they are placed in the right upper corner. Bracket marks include quotation marks, parentheses, title marks, etc. They should be positioned in pairs at either side of the marked character(s), have the same dimensions as a character, and the same direction as the characters. Bracket quotation marks have different positioning rules in different areas. In Taiwan, single quotation marks will be used first and then double quotation marks, whereas in Chinese Mainland, double quotation marks will be used first and then single quotation marks. Also, the writing mode should be taken into consideration as well. Horizontal writing mode requires curved quotation marks while vertical writing mode requires angle brackets. Ellipses and long dashes, should be vertically and horizontally centered within their square frame, and should be one character in height and two characters in width. They are not supposed to be separated from one line to the next and should be positioned in the same direction as the characters. Connector marks should take up the same dimensions as a single character, and be vertically and horizontally centered within its square frame. Among the connector marks, the EN DASH should have a short length to distinguish it from the Chinese character [一], which means one. And they should be positioned in the same direction as the characters they mark. Middle dots should be vertically and horizontally centered within their square frame. To make more economical use of the available space, or to tighten the overall spacing, sometimes the solidus can have a half character width. Interlinear marks like title marks, wavy low lines, and emphasis dots should be positioned underneath the marked characters in horizontal writing mode. In vertical writing mode, emphasis dots should be positioned to the right side of the marked characters so as not to affect the characters above and beneath them. Solidi should be vertically and horizontally centered within their square frame. As GB rules, it should take half a character width, whereas in Taiwan, there is no clear rule about its dimensions but most publications will give them the same dimensions as a single character. Proper noun marks should use U+FF3F FULLWIDTH LOW LINE [＿] and be positioned to the left of the marked characters. Emphasis dots should be positioned to the right of the marked characters. Science and technology literature prefer U+FF0E FULLWIDTH FULL STOP [．] to U+3002 IDEOGRAPHIC FULL STOP [。] so as to make a clear distinction from the letter [o] or digit . In Traditional Chinese publications such as ancient books, science and technology literature, textbooks, or books that have quotations in Western languages, some pause or stop punctuation marks, including the slight-pause comma, colon and period, are positioned following the marked characters. The same applies for Simplified Chinese as well as Japanese so as to unify punctuation styles for both Chinese and Western languages. In order to maintain a smooth reading experience and consistency of style, there are certain constraints for the positioning of most punctuation marks. In most cases, according to its function, a punctuation mark is prohibited from appearing at the line start or line end. This rule was first implemented during the time of letterpress printing. In Mainland China, the national standard General Rules for Punctuation (GB/T 15834–2011) sets clear rules about the positioning of punctuation marks. In Taiwan and Hong Kong, there is not yet a standard for the usage and positioning of punctuation marks, but most of the publications apply the rules described in this document. In Taiwan and Hong Kong, there is no strict rule indicating that a punctuation mark must not appear at the line start. In the time of letterpress printing, there were quite a few publications which ignored the prohibition rules for punctuation marks. In publications in Taiwan and Hong Kong like newspapers and magazines, columns are often used in the layout, which leads to fewer characters in each line, and prohibition rules of punctuation marks are sometimes ignored under these circumstances. In order to avoid a punctuation mark appearing at the line start, the last character from the previous line can be moved to the beginning of next line and the extra space left for the previous line will be divided and inserted equally between the characters of previous line. However, in the case where several punctuation marks appear together, for example [。』」], moving one character from previous line might cause too much space left between the characters. In this case, the punctuation marks might be allowed to appear at the line start so as to keep a reasonable space between characters in each line. Pause or stop punctuation marks, like slight-pause commas, commas, semicolons, colons, periods, question marks, exclamation marks, as well as right quotation marks, right parentheses, right angle brackets, dashes, etc, should not appear at the line start. Left parentheses, left quotation marks, left angle brackets and left title marks should not appear at the line end. The following punctuation marks should be considered as one unit and take two character widths. They should not be separated into two lines. In cases where multiples of such punctuation marks appear together, it is allowed to separate them into two lines as described in . If they were forced to remain on one line, it might cause too much space between the characters in the previous line and decrease the aesthetics of the entire composition. In the digital era, these punctuation marks usually take the width of 2 characters but are still considered as one unit. Em dash and long dash. Long dashes [——] can be created using U+2E3A TWO-EM DASH [⸺] or two adjacent U+2014 EM DASH [—] characters. Both alternatives should take one character height and two character widths. When two U+2026 HORIZONTAL ELLIPSIS […] characters are used together for ellipsis, they are, together, the height of one Hanzi character and the width of two Hanzi characters and consist of six dots. According to section 5.1.5 of the General Rules for Punctuation (GB/T 15834―2011), when two horizontal ellipses are used together, they should be four characters wide and occupy an independent line. Punctuation marks in Chinese usually have the dimensions of one character (or more). This provides a clear distinction between characters and leaves some room for compositional adjustment. However, if there is no character before or after the punctuation mark(s), the empty space around the punctuation mark(s) will seem a bit abrupt. In this case, proper compression for the punctuation mark(s) will make the composition tighter and more readable. Usually there are two ways to compress punctuation mark(s). First, when multiple punctuation marks appear together, the space between the punctuation marks can be adjusted; second, when multiple punctuation marks appear at the line start or line end, the space at the line start or line end can be adjusted. When opening bracket(s), closing bracket(s), slight-pause comma, comma, period or interpunct appear together, the following rules for space adjustment will make the composition tighter and more readable. In common rules of Chinese Mainland, when one or more closing brackets appear behind a slight-pause comma, comma or period, the space can be reduced by half a character width. Such adjustments will not be done in Taiwan and Hong Kong. When a slight-pause comma, comma or period appears after a closing bracket, the space can be reduced by half a character width. When an opening bracket appears after a slight-pause comma, comma or period, the space can be reduced by half a character width. When an opening bracket appears after a closing bracket, the space can be reduced by half a character width. When two or more opening brackets appear together, the space can be reduced by half a character width. When two or more closing brackets appear together, the space can be reduced by half a character width. When a solidus appears after a closing bracket, the space can be reduced by a quarter of a character width. When a solidus appears before an opening bracket, the space can be reduced by a quarter of a character width. When a punctuation mark appears at line start or line end, the following rules for space adjustment will make the composition tighter and more readable. For the case of line head indent, if a bracket is set at the beginning of a line, half a character space can be reduced ahead of the bracket. When an opening bracket appears at the beginning of a line, half a character space can be reduced ahead of the bracket. When a closing bracket appears at the end of a line, half a character space can be reduced behind the bracket. Most Chinese publications do not use hanging punctuation at line end. According to the Japanese Layout Requirements document, hanging punctuation at the line end is a kind of extension of the prohibition rules at line start. This rule helps to avoid moving characters or punctuation marks between lines and avoids inconsistency of space between the characters in different lines. In general, the punctuation marks that can be hung at the line end include slight-pause comma, comma and period. In Simplified Chinese, all the pause or stop punctuation marks can be hung at line end since they are positioned at the starting point of the character dimension. If a punctuation mark (slight-pause comma, comma or period) is expected to be at the start of a line, it should be placed at the end of the previous line, to fit in the type area. However, in Taiwan and Hong Kong, which sets the punctuation marks at the center of the square space for it, hanging the punctuation marks might make an abrupt affect on the composition. Therefore, Traditional Chinese does not apply hanging punctuation in horizontal writing mode but only in vertical writing mode. In the case of a succession of punctuation marks, punctuation hanging should not be applied. One Western letter used as a symbol for something, such as 'A' or 'B'. A Western word is used in a Chinese context, such as 'editor'. Acronyms, such as 'DTP' or 'GDP'. Book titles or authors in references to Western books that use the original spelling. European numerals used to express years or other numbers, such as '1999年'. Western numeric characters are also used in itemized lists and numbered headings, or as symbols for chemical elements or mathematical formulae. It can be seen from these examples that it is an everyday occurrence to find Western characters mixed with Han characters in Chinese composition. Western numerals, sometimes called arabic, or arabic-indic numerals, are referred to as European numerals in the context of this document, unless notes indicate otherwise. Formerly, fullwidth ASCII characters were often used, either to make the presentation look orderly, or simply due to the poorly developed computer technologies available for text layout. Nowadays, typesetting engines allow for proportional or monospace fonts, as required, rather than forcing the user to resort to the old fullwidth blocks of Latin letters and European numerals. When Western texts are mixed with Han characters, Chinese style punctuation and its common usage should be used in principle since the main text is Chinese. However, in the case of technical documents, if plenty of formulae are contained in the text, the full stop can be unified with the western-style period, U+002E FULL STOP [. ], and the horizontal ellipsis can be unifed with the western-style ellipsis, U+2026 HORIZONTAL ELLIPSIS […]. The way glyphs are distributed in the character dimension follows the Western convention. Also in textbooks on the grammar of Western languages, which contain plenty of example sentences mixed with Chinese, the forementioned western-style periods can be used. In horizontal writing mode, the basic approach uses proportional fonts to represent Western text and uses proportional or monospace fonts for European numerals. In principle, there is tracking or spacing between an adjacent Han character and a Western character of up to one quarter of a Han character width, except at the line start or end. Another approach is to use a Western word space (U+0020 SPACE), in which case the width depends on the font in use. Setting Western letters with Han character width monospace fonts. Letters or European numerals follow each other, one at a time, in the same direction and orientation as the Han characters. This arrangement is usually adopted where the text contains a single letter or digit, or an acronym (such as GDP). Setting Western letters with proportional fonts, rotated 90 degrees clockwise. This approach is usually adopted where Latin letters compose a word or sentence. There is tracking or spacing between a Han character and an adjacent Western letter or European numeral, up to a width of one quarter of a Han character, except at the line start or end. Setting European numerals with proportional fonts in horizontal-in-vertical orientation. This style is usually adopted when dealing with a two to three digit number whose width is equal to the default line advance or slightly wider (within an acceptable range). Han numerals are usually used in vertical writing mode, however, in recent years it is becoming more common to see fullwidth European numerals and proportional numerals set as horizontal-in-vertical. Quotation marks are usually not used in vertical writing mode (corner brackets are used instead). However, when quoting Western text, quotation marks are sometimes used to match Western style. In this case, the orientation of the quotation marks must follow the quoted Western text (rotated 90° clockwise). A sequence of Western characters in a Western word should not break across a line-break, except where hyphenation is allowed. Tracking or spacing between a Han character and a Western letter or numeral is up to a quarter of the width of a Han character. Justified text alignment is an important feature of Chinese composition. It is harder to align text as expected when a line contains Western characters. Typically, spacing or tracking is applied equally across the line, but such adjustments are only applied between Han characters or between Han and Western letters. The spacing is not equally distributed between characters in Western words and/or European numerals. Tracking or spacing of Western letters or European numerals before the line start or after the line end are not justified. Tracking or spacing of Western letters or European numerals is not adjusted before or after Chinese commas or full stops, nor after Chinese opening and before Chinese closing brackets. Instead of a quarter Han-width tracking between Han and Western letters, it is possible to use flexible spacing of up to half a Han character width. This brings the space occupied by Western characters to a multiple of the width of a Han character. In this way, both the Han character before and after the Western language span snaps to the grid lines. When a Western word appears at the line end and needs to be broken, rather than breaking the word at a syllable boundary per the Western convention, the word may be forced to break at the line end, in order to ensure correct alignment. When using grid alignment, it is recommended to deal with line end punctuation marks by hanging the first of them outside the type area as mentioned in section . In situations that involve consecutive punctuation marks, the second and following punctuation marks are allowed to appear at the line start. Grid alignment is adopted more often in Traditional Chinese typesetting, whereas use in Simplified Chinese is rare. Chinese interlinear annotation, also known as ruby, refers to small, supplementary text attached to certain characters or words in the main text. Chinese interlinear annotation is usually set in the interlinear space and aligned to the corresponding base text which it annotates. In Chinese typesetting, Chinese interlinear annotation is mainly used to indicate pronunciation or meaning. In Chinese, interlinear annotation is most commonly used to indicate the pronunciation of Han characters. Presenting the pronunciation alongside the characters is a great help to beginners, especially to children who are native speakers, or to foreigners intending to study Chinese. Therefore, it is rare to annotate isolated Han characters. Instead, phonetic annotations tend to cover the full text. Also, it is not regular practice in Chinese layout to use interlinear annotation for pronunciation outside these educational contexts, even for the pronunciation of rarely used characters, although sometimes pronunciation is provided inline, possibly within brackets. There are two major annotation systems for indicating Chinese pronunciation: Zhuyin and Romanization. Mandarin Phonetic Symbols (國語注音符號) or Taiwanese Dialect Phonetic Symbols (台灣方音符號), hereinafter referred to as ‘Zhuyin’, are systems for phonetic annotation mainly used in Taiwan, although other areas may also include Zhuyin in certain dictionaries or textbooks. In most cases, Zhuyin appears on the right side of its corresponding base text. Exceptions are very rare. Hanyu Pinyin (汉语拼音), now the official standard in Mainland China, uses the Latin alphabet to transcribe the Modern Standard Chinese (Mandarin) pronunciations of Chinese characters. The most common use case in Mainland China is to indicate the pronunciation for all characters of the full text with Hanyu Pinyin. In Taiwan and areas that use Chinese dialects in China, the arrangement of the Taiwanese Romanization System for Minnan (台灣閩南語羅馬字), or romanization systems of other Chinese dialects are similar to those of Hanyu Pinyin. Due to the characteristics of the Latin alphabet, such annotations appear in horizontal writing mode only. Texts for children who are native speakers usually provide reading assistance for each individual character, while texts for those who are learning Chinese as a second language mainly indicate pronunciation for whole words, but occasionally, both of them are set almost the same. There is space between the base text when whole words are annotated, and the interlinear annotation characters will have unique requirements such as sentence case, or punctuation marks corresponding to base characters. Early publications using pinyin are very varied and lack consistency. Both character-based and word-based annotations are quite common. No further description of the early pinyin will be found in this document. Bilingual annotations aim to provide a Chinese translation of text in foreign languages or acronyms, or to offer the original text for words that have been translated into Chinese. This is mainly used for proper nouns, titles or those terms whose concepts are difficult to convey after translation. It is commonly found in translated works, mainly in light novels. Interlinear comments are ways to annotate the meaning of text fragments or a single word, and are so named for their interlinear positioning. They usually lie in the interlinear space and co-exist with the body text. Compared to other annotation methods, i.e. headnotes or footnotes, interlinear comments are more compact and stick better to the body. These kinds of comments are often found in ancient books, such as Rouge Inkstone, an early commentary of the novel Dream of the Red Chamber. In vertical writing mode, Zhuyin, Romanization or bilingual annotations are usually placed on the right side of the base text (Han characters), while interlinear comments are often placed on the left side. In horizontal writing mode, Zhuyin can be placed above the base text, but in most cases they are still set to the right side of the base text. On the other hand, Romanization and bilingual annotations can appear both above or below the base text, and the interlinear comments are usually placed at the bottom of the base text. In principle, Zhuyin Phonetic Symbols are of the same size, and the number of Zhuyin symbols for one Han character is never more than three, which is quite easily manageable. Romanization, however, uses Latin letters whose sizes are proportional, their composed lengths are varied and there should be spaces between the words. Thus, these two kinds of phonetic annotations differ greatly in positioning. Annotating with both Romanization and Zhuyin is a practical way to indicate the reading to readers who know only one of these systems, as well as helping study of or enquiries about the other one. Normally, when Romanization and Zhuyin are both provided, the Zhuyin are placed on the right side of the Han character while Romanization is set at the bottom of the Han character in horizontal writing mode and to the left side in vertical writing mode. According to the Handbook of Mandarin Phonetic Symbols (國語注音符號手冊) released by the Ministry of Education in Taiwan, there are two standard ways of positioning Zhuyin: above the corresponding Han character (horizontal Zhuyin), or on the right side of the corresponding Han character (vertical Zhuyin). The use cases for putting Zhuyin above the base characters are rarely found in today's textbooks or other publications, and it is rarely used by the public at large. Therefore, it's always better practice to place Zhuyin annotations on the right side of their corresponding Han character, whether in horizontal or vertical writing mode. The size of Zhuyin annotation marks, including the phonetic symbols and their tones, should not exceed the size of the corresponding base characters. When Zhuyin annotation marks are placed above or to the right side of the base characters, the width of the Zhuyin annotation marks should not exceed the size of the corresponding base characters. When Zhuyin annotations are placed to the right side of base characters, in principle they should take half of the space of the corresponding base characters. The space should include the phonetic symbols as well as the tone marks. Zhuyin annotations without tone marks, such as the level tone in Mandarin, should take the same amount of space as annotations with tone marks. In vertical writing mode, when Zhuyin annotations are placed to the right side of the base characters (vertical Zhuyin), the line gap of the paragraph, where the Zhuyin annotations should be placed, needs more than 1.5 times that of the base characters. The type area should be designed to allow the proper space for the line gap. If the line gap is more than 1.5 times that of the height of the base character, the line gap should not be affected, whether there are Zhuyin annotations between the lines or not. In horizontal writing mode, when Zhuyin annotations are placed to the right side of the base characters (vertical Zhuyin), the spaces between the base characters, where the Zhuyin annotations are placed, should be at least half of the width of those characters. To achieve grid alignment, the characters without Zhuyin annotations, such as punctuation marks, Western words and indented space should keep the same space as well. In principle, the size of Zhuyin annotations (including the phonetic symbols and the tone marks) to that of base characters ratio should be 3:10. In vertical Zhuyin, Zhuyin annotations should be vertically center-aligned to the base character, while in horizontal Zhuyin, Zhuyin annotations should be center-aligned over the base character beneath them. The percentage rules above assume that all the tone marks (ˊˇˋ˪˫ㆴㆵㆶㆷ) and the neutral tone mark (˙) are set with the same font size as that of the base characters. In vertical Zhuyin, the width of the space taken by the neutral tone mark does not change but the height ratio to the base character should be 1:15. In horizontal Zhuyin, the height of the space taken by the neutral tone mark does not change but the width ratio to the base character should be 1:15. When annotating Zhuyin for paragraphs with characters in larger sizes, the size of the Zhuyin annotations can be adjusted accordingly. Mandarin non-neutral tones and dialectal non-checked tones, are placed outside the upper right corner of the last phonetic symbol. In vertical Zhuyin, half the space taken by a tone mark will be above the top of the adjacent phonetic character; in horizontal Zhuyin, half the space taken by a tone mark will appear to the right of the phonetic character. As seen in . The dialectal checked tones are set outside the lower right corner of the phonetic symbols. As seen in . The Mandarin neutral tone comes before the phonetic symbols. In vertical Zhuyin, the height of the tone mark is 10% of that of its base character, while its width is the same as that of the phonetic characters. In horizontal Zhuyin, the width of the tone mark is 10% of that of its base characters, while its height is the same as that of the phonetic characters. As seen in . In Mandarin Chinese there are syllables that are, when part of certain words or sentences, intentionally read in a shorter and less-emphasized way, therefore losing their original tone. When any syllable is read in this way, we say that it has a neutral tone or is “toneless”. Like the line prohibition rules for punctuation, vertical Zhuyin annotations should stick to their base characters in horizontal writing mode. They must not appear in the line head, and must be placed on the right side of their corresponding Han character. Romanization is only available in horizontal writing mode. These phonetic annotations are usually placed on top of the base text. In general, phonetic annotations and their base text stick to each other regardless of space, and both of them are center-aligned. In special cases where Romanization is needed in vertical writing mode, the annotations are usually set to the right side of their corresponding base text, but it is difficult to read anyway. If a Romanized annotation is longer than its base text and is at the line head or end, both the annotation and the base text can be aligned to the beginning of the line head or end. The space between two adjacent annotations should not be smaller than the size of a normal Western-language space, which is about 1/4 em. Due to the limitation of typesetting technologies, there is usually no space between the rather long phonetic annotations in many printed publications. Luckily, this is not likely to lead to ambiguity because each Han character contains one syllable and most Pinyin fragments are easy to tell apart. However, these annotations can be misleading sometimes. For example, character-based phonetic annotations may result in the false impression that they are word-based. Also, the accidentally concatenated annotations may disrupt word boundaries, which alters the semantic meanings of the words. Annotations are allowed to extend over the top of the adjacent base text as long as the minimum spacing is ensured. As most target readers are beginners to Chinese, the body text is usually in larger sizes and in the Kai typeface. Due to the fact that Latin letters are proportional (width unknown) and that the advance widths in different typefaces deviate greatly from one another, the relationship between the sizes of annotations and their base text is somewhat undetermined. Under the influence of the typesetting of Japanese furigana, however, annotations are usually of half size of the base text. Annotations usually use a sans-serif typeface which is rather thin and plump. It is generally the opinion in publishing and in education that Hanyu Pinyin must use those typefaces in which ‘a’ and ‘g’ are single story and the second tone mark is thick on the lower part and thin on the upper, as in the handwritten style of the stroke. Actually there have never been any national standards specifying the typefaces and the glyphs for Hanyu Pinyin. The General Association of Chinese Culture in Taiwan once wrote to the Ministry of Education in Mainland China about the rules for the glyphs of Hanyu Pinyin, and received the response that the glyphs of the letter ‘a’ and ‘g’ correspond to those of Latin. There is no requirement demanding the handwritten glyphs. What follows is a detailed description of the difference between two typical use cases. The base text is a single Han character. Only Han characters are annotated: European numerals or punctuation marks are excluded. The phonetic annotations are always on the top. As the phonetic annotations are often wider than their base text, the tracking of the body text should be larger, to allow annotations to expand and to avoid irregular adjustments within the base text. The phonetic annotations are all in lowercase. Sentence case is rare. The base text contains one or more Han characters. Rules for separating terms can be found in Basic Rules of Hanyu Pinyin Orthography (GB/T 16159—2012). Annotations sometimes appear below the Han characters. Both the phonetic annotations and the base text are separated at word boundaries. The adjacent annotations are separated by a space approximately 1/2 em wide, while the tracking inside the base text is usually normal. Many word-based annotations indicate the logic of the whole sentence, rather than merely the pronunciation: these phonetic annotations have sentence case, as well as punctuation marks which follow the previous annotations. Erhuayin, also known as rhotacization of syllable finals, is a special phonetic phenomenon in Modern Standard Chinese (Mandarin). Due to the limitations of annotating single Han characters, the Zhuyin annotations fail to indicate the continuity of Erhuayin and the change of the final sound, while Romanization shows the features of Erhuayin effectively. Ligatures are special for their multisyllabic nature, thus its interlinear annotation may be typeset incorrectly. The pronunciation of ligatures should be bracketed inline or given in notes instead. Ligatures are rare in the modern Chinese writing system. Typesetting of bilingual annotations is actually quite similar to that of Romanization. Annotations are usually placed to the right of the base text in vertical writing mode, or above the base text in horizontal writing mode. In order to maintain the integrity of annotations, when the lengths of annotations and their base text are different it is necessary to adjust the alignment between them to avoid misunderstandings. When the length of an annotation is shorter than that of its base text, the annotation can be center-aligned (in the case of Western script) or use larger tracking (in the case of Han characters). There are two methods to satisfy the latter, one is to equally distribute the spacing while the other is to align justified. When the length of an annotation is longer than that of its base text, the base text can be center-aligned (in the case of Western script) or use a larger tracking (in the case of Han characters). Interlinear comments can have very varied layouts and lengths. They are usually placed at the foot side of the annotated text — to the left side of the base text in vertical writing mode or below the base text in horizontal writing mode. Sometimes the interlinear comments are in other colors to help the reader tell the difference from the body text. Interlinear comments are also used to explain the context and details of a longer text fragment. In such cases, due to the ambiguity of the base text, the annotation can find a suitable place as an anchor and flow down. There's no strict requirement for its length, and sometimes it can be longer than one line. A paragraph, a section of a document which consists of one or more sentences to indicate a distinct idea, usually begins on a new line. For the related line head indent at the beginning of paragraphs, the following methods are available. For Chinese publications, line head indent at the beginning of a paragraph usually uses two character width spaces. Publications like magazines, with multi-column content and less text in each column, might apply a single character width line head indent at the beginning of paragraph as well. Line head indent at the beginning of a paragraph is applied to all paragraphs. Nearly all books and magazines make use of this method. Line head indent does not apply to the first paragraph but to the rest of the paragraphs. This method is mostly seen in Western publications. Line head indent at the beginning of a paragraph is not applied for any paragraph at all. A certain amount of space is inserted between the paragraphs so as to indicate the distinction between different paragraphs. In some books and magazines this method is applied. In principle, some unfinished paragraphs should be broken rather than apply the line head indent for the following paragraph. Dialogs, quotations or subtitles that the editor inserted might appear before the unfinished paragraph. In principle, there is no extra space between paragraphs in Chinese books. The space between the last line of the previous paragraph and the first line of the next paragraph stays the same as the space between the rest of the lines in the paragraph. If a blank line is inserted after a paragraph, usually it indicates the end of the section or chapter. If there is no indent but extra space is added among the lines as an indication of separation, no blank line should be inserted to indicate the end of the section or chapter. Alongside the case of applying indents to the beginning of all lines, there is also the method that indents the second and following lines of the paragraph, called tupai [凸排] or itemization, used in cases such as dramatic script lines and lines starting with the name of a person. Numbered lists of items, questions and answers (Q&A), and legal provisions utilise this method as well. Though called tupai [凸排] or itemization, the beginning of the line should not go beyond the type area. When the tupai [凸排] or itemization method is used, the indent of the second line and the rest usually takes a fixed amount of space such as three characters plus one colon which takes four-character space. When the name of a person is less than three characters, a certain amount of space should be inserted between the characters so as to keep the same width as four. The paragraph indent is the indentation of the line head by a fixed amount, starting from the line head side of the type area (in the case of one column) or of the column area (in the case of several columns). This method is usually applied for quotations, poetry or subtitles in a paragraph or between the paragraphs. Line alignment method is a process for setting the alignment of each line of text so that the actual position of the text can be matched with their preset position. The following methods are available. The space between adjacent characters is, in principle, set solid. Also, if there is an explicit instruction to insert spaces, such spaces are inserted. This is used if characters are not set solid, but have a fixed space between characters; the amount of space at the line head and line end is made equal, and the center of the character sequence is unified with the center of the line. The space between adjacent characters is, in principle, set solid. Also, if there is an explicit instruction to insert spaces, such spaces are inserted. This is used if characters are not set solid, but have a fixed space between characters; the start of the character sequence is unified with the line head, and if the line is not full, the line end is kept empty. The space between adjacent characters is, in principle, set solid. Also, if there is an explicit instruction to insert spaces, such spaces are inserted. This is used if characters are not set solid, but have a fixed space between characters; the end of the character sequence is unified with the line end, and if the line is not full, the line head is kept empty. The space between adjacent characters is, in principle, set solid. Also, if there is an explicit instruction to insert spaces, such spaces are inserted. In addition, using the space made available during line adjustment processing, equal character spacing is applied where possible. The start of the character sequence is aligned to the position of the line head, and the end of the character sequence to the position of the line end. A frequently seen case of even inter-character spacing is that, after applying the punctuation prohibition rules to each line, some lines will have more than one character space left, so in order to align the beginning and ending with the rest of the lines, this line should apply even inter-character spacing. Even inter-character spacing is often used for listing names of people or objects. The last line of a paragraph or a paragraph with only one line can have even inter-character spacing applied as well. In the tradition of Chinese composition, an orphan does not make a line, nor does a widow make a page. The principles are as described below. If there is only one character or one character with a punctuation mark left in the last line of a paragraph, this character is called an orphan. An orphan can be processed using the following methods, so that more than two characters can be positioned in the last line of a paragraph. Similar to the handling for the prohibition rule that punctuation marks should not appear at the line start, the last character of the previous line can be moved to the next line, and the previous line should apply even inter-character spacing. Delete some character(s) from the previous paragraph so that there will be enough space to move the orphan back to the previous line. Add more characters to the last line. The definition of orphan in Chinese typesetting has some similarity with the definition of orphan in Latin typesetting. Refer to section 5.2 of Requirements for Latin Text Layout and Pagination . If the first line of a paragraph in a page is the last line of a paragraph from the previous page, it is called a widow. A widow can be handled via the following methods. Move the widow line to the previous page and it can go beyond the tape area. Move the last line of the previous page to join the widow. Delete some characters from the paragraph so that there will be enough space for the widow to be moved back to the previous page. Add more characters to the widow so that there will be more than two lines on the page. The definition of widow in Chinese typesetting has some similarity with the definition of widow in Latin typesetting. Refer to section 5.1 of Requirements for Latin Text Layout and Pagination . There is only one line in a page and the line consists of one character and a punctuation mark, which makes the text an orphan and widow at the same time. There are multiple paragraphs in a page but the first line is a widow and the first line consists of one character and a punctuation mark, which makes the orphan and widow appear together. There is only one line in a page, which makes the line a widow. There are multiple paragraphs in a page but the first line is a widow. There are multiple paragraphs in a page but one of the lines consists of one character only, which make the only character an orphan. There are different viewpoints on how the orphans and widows should be handled in the cases above due to differences between publishers. Case (a) and case (b) have a bigger affect on typesetting while case (c) affects it less. Cases (d) and (e) are rarely seen. In terms of text composition, there are three types of headings. Due to the composition requirements, magazines usually handle headings in a variety of ways, while most books have their headings set up in a simpler way. Methods for handling of headings for magazines will not be described in this document. Whole page headings are used when there is a need to separate sections in a book, usually on a separate page with the following page left blank. Sometimes subheadings, selected sentences, names of the authors or selected paragraphs will also appear with the heading. The back side of the heading page is not necessarily always blank, for example, consider the Han-tobira in Japanese books, whose following even page is not blank, and is used for the main text. A block heading is the heading occupying a whole, independent line. The main text is set on the very next line. Top level headings and medium level headings are of this type. Headings are subtitles, which separate and indicate sub-parts with one coherent set of content. Headings are usually classified into several levels such as top level headings, medium level headings and low level headings. The sequence of headings on a page should be the name of the book, the section heading, the top level heading, the medium level heading followed by the low level heading. The structure of a heading depends on the detailed context of the book. It is suggested not to set too many levels for headings. In a multi-column format, block headings sometimes span multiple columns. These are called cross-column headings. A run-in heading is a heading immediately followed by main text without a line break, and is usually used as a low level heading. Note that a low level heading can also appear as a block heading. Character size for the heading: The character size of headings should be selected in accordance with the level of headings. For example, when the character size of main text is 9 point, the small headings are usually set in 10 points, medium headings are usually set in 12 points and large headings are usually set in 14 points. The character size of headings is usually larger than that of the main text. When this rule is applied, the characters in the heading should be 10% to 20% larger. And the character size of higher level headings is larger than the size of smaller size headings. Type faces for headings: Both Hei or bold Song are usually used. Other type face designs like Yuan and Kai are sometimes used as well. In letterpress printing, when Song is used as the type face of the heading, it is always designed with a larger size; while in digital printing, due to its special typography, simply increasing the font size is not enough, the characters usually use bold style to indicate emphasis. When Hei is used as the type face of low level headings, the font-weight should be increased to emphasize the heading. Alignment of headings (inline direction): In the case of horizontal writing mode, large headings and medium headings are in most cases center-aligned. In the case of vertical writing mode, headings are usually aligned to the line head with some indent. The number of characters of line head indent for a heading depends on the heading level. If the heading level is higher, the indent character number is less, if the heading level is lower, the number of indent characters is more. The character size is based on the main text of the type area. The difference in character numbers is usually around two characters. Whether to decorate with solid lines, images, or give a symbol on the top of the heading. Always begin with odd pages, i.e. new recto. Books usually begin with page 1. Accordingly, vertical writing mode and books bound on the right-hand side begin with a left page, horizontal writing mode and books bound on the left-hand side begin with a right page after a new recto. Always begin with new pages, regardless of even pages or odd pages, i.e. page breaking. Used for large headings. When medium headings or small headings appear on the last line of a page and there is no space left for the following paragraphs, the medium headings or small headings should be moved to the next page. In the case of single column typesetting, the spaces just before the new rectos and page breaks are left as they are. In the case of multiple columns, the remaining space of preceding columns is left as it is. In the case of vertical writing mode, columns are filled with text lines from upper right to lower left. There is no need to align line numbers of the upper column and lower column, and remaining spaces are left as they are. In horizontal writing mode and multi-column format, the number of lines for each column is set to be the same, but where the result of the total number of lines divided by the column number chosen for the type area results in an odd number, the last column may have a smaller number of lines and may be followed by a blank space. Run-in headings are usually used for low level headings. The following are some examples of run-in headings. Inter-character space between the run-in heading and following main text is usually a one character space of the base character size decided for the type area. Note that the run-in heading may be set at the last line of the page, or of the column in multi column style. The run-in heading is set with the same character size as the main text and in Hei or Kai. Set the run-in heading in a character size not smaller than the main text and use Hei or Kai. The space that the run-in headings take is not an integer times larger than the characters in the body content, and the space between the run-in headings and body content can be adjusted so as to align the body content as well as the line start and line end. Set the run-in heading with the same character size and typeface as the main text, but add heading numbers or Western characters in front of the heading. Three exclamation marks used sequentially should take space of two characters. In some special circumstances, especially in Traditional Chinese publications, it is sometimes allowed to have the pause or stop punctuation marks appear at the beginning of a line. Takes space of two characters, in the shape of a single line without a break. Takes space of two characters, in the shape of a single line without a break, center-aligned both vertically and horizontally. Takes space of one character, and can be adjusted to half a character width in some cases. The content above is from Big5 encoding. Mainly used in Simplified Chinese. Mainly used in Traditional Chinese. In some special circumstances, especially in Traditional Chinese publications, it is sometimes allowed to have the indication punctuation marks appear at the beginning of a line. Takes space of one character, and usually used in Simplified Chinese. Corner brackets (『』「」) are usually used in vertical writing mode. The area, usually in the center of a printed page but without bleed and images, works as the main area for content printing. A relative index for the length which is equal to 1/2 of a given character size. A square character frame that has a character advance of 1/2 character size. The marks that aid texts to record language, they are organic part of wrtting language, expressing pause, mood and special nature and functions of some parts (mainly words) in a sentence. The rules for type setting by compressing the space for the punctuation marks in the beginning or ending of a line or the space between consecutive punctuation marks. Puctuation marks for indication, mainly for marking the special nature and function of a part (mainly words) of a sentence. The way to indicate the pronunciation of the Chinese characters, e.g. interlinear annotations. A proportional typeface contains glyphs of varying widths in order to make the glyphs properly related in size. It is widely used in Latin characters. The part of graphics that goes beyond the edge of final page that will be trimmed off. The bottom margin between the edge of a trimmed page and the type area. Punctuation marks for breaking, mainly for pause and mood, including marks at end-sentence and in-sentence. The closing side of the content in a type area. Usually, for vertical writing, it is on the left side while for horizontal writing, it is in the bottom. The beginning side of the content in a type area. Usually, for vertical writing, it is on the right side while for horizontal writing, it is in the upper side. In standard Chinese and certain dialects, some words have rhotacized endings that result in phonetic changes to how the word sounds. The writing system of Chinese using characters that are relatively more complex in structure and stroke count. Known as Traditional Chinese because of its long history of use. Cf. Simplified Chinese. The usage of words as the segmentation unit for the romanisation of Chinese. The usage of characters as the segmentation unit for the romanisation of Chinese. The rules for certain punctuation marks that do not allow any spaces between them. Literally "orphan line", the paragraph-ending line that falls at the beginning of a new page or column, or the paragraph-opening line that appears by itself at the end of a page or column; both separated from the rest of the text. Literally "orphan character", the paragraph-ending single character, with or without punctuation, became the last line of a paragraph. The height of a single line. Western scripts refer to this as the vertical distance between lines of text measured from base line to base line. Comments included between lines, generally free-form with no restrictions on line length. These can exceed the length of a single line. Annotations between lines used to indicate the pronounciation of a word or an explanation of a word. Due to the varied nature of the different punctuation marks, punctuation rules for the start of a line differ from that for the end of a line. Typesetting punctuation for line endings outside the margin of alignment, also known as hanging punctuation or exdentation. Hanyu Pinyin provides a method of using Latin characters with diacritics to indicate tone. It is often used to teach Standard Chinese and encourage its use as a common language for communication. Characters that form the basis of the Chinese language. The process or the result of arranging characters on a line from left to right, of lines on a page from top to bottom, and/or of columns on a page from left to right. A glyph form that combines two or more letters or ideographs. The traditional printing method using movable type. The writing system of Chinese using characters that are relatively simpler in structure and stroke count, mainly refer to Jianhuazi (Simplified Character) published and revised in 1960s in Mainland China. Cf. Traditional Chinese. General term for punctuation marks used within a sentence that to include additional information for clarification or for emphasis. The ending character of the paired brackets, which include quotations, parentheses, Book Title Marks etc. The semivowel between initial and main vowel in Chinese syllable. A character to be annotated by ruby, ornament characters, or emphasis dots. The opening character of the paired brackets, which include quotations, parentheses, Book Title Marks etc. The letters of Latin alphabet. A partition on a page in multi-column format. Amount of space between columns on a page. The conversion system of writing from Chinese pronunciation into Roman/Latin script. To arrange characters with no inter-character space between adjacent character frames. The ending point of a line, meaning the bottom side in vertical writing mode, or the right side in horizontal writing mode. A kind of special tone phenomenon in modern standard Chinese, with no fixed tone. The alignment method to align on both the left and right ends of each line of one paragraph text. A relative index for the length which is equal to a given character size. A square character frame that has a character advance of character size. One of four tones in Historical Chinese phonology, which has short and brief pitch. The pitch contours in language to distinguish lexical or grammatical meaning in one syllable. There are 4 tones, e.g. Ping (level), Shang (rising), Qu (departing), Ru (entering) in Historical Chinese phonology. The initial consonant of a Chinese syllable. The text or character that is near the beginning of the line. Normally, when the text is in vertical writing mode, the starting point is on the top; in horizontal writing mode, the starting point is on the left. A text setting with a uniform inter-character spacing. The top margin between the top edge of a trimmed page and the type area. Writing systems derived from Greek and Latin. Use of the hyphen to join words and to separate syllables of a single word. The part in a Chinese syllable without initial and tone. Characters with the feature of tabulation. The process or the result of arranging characters on a line from top to bottom, of lines on a page from right to left, and/or of columns on a page from top to bottom. To prompt a Chinese term with its original or translation in the form of annotation text or base text, an instance of interlinear annotation. The process of interleaving Chinese text with Western text. Interlinear text run indicating pronunciation or definitions. The general name of Mandarin Phonetic Symbols and Taiwanese Phonetic Symbols. Size of a character frame in the inline direction. Area in which glyph is drawn. A set of letters, characters or symbols, which are designed to have coherent patterns to be used for printing or rendering to a computer screen. A set of glyphs with the same design, often referred to as typeface nowadays. A symbol of identifiable abstraction, depending on no specific design. The process, under the premise of justification, of arranging characters within grids to make sure that they are aligned in both horizontal and vertical axes. To typeset a (small) group of characters horizontally within a vertical line of main text. The following changes were made since the previous publication. Fixed the descripton of long dashes. Changed the description of Traditional/Simplified Chinese differences to regional differences. Various editorial and formatting fixes and translation improvements. Special thanks to the following people who contributed to this document (contributors' names listed in in alphabetic order). Addison Phillips, Buernia, 陳穎青, Hao Chen, Hawkeyes Wind, 贺师俊 John Hax (百姓网), 侯迈 MieMie (豆瓣), Jiang Jiang (Opera), 吕康豪 Kang-hao Lu (BGI), 权循真 Xidorn Quan (Mozilla), SyaoranHinata, technommy, Virgil Ming, and Zhengyu Qian.